If you are searching for the ideal Honeymoon destination for you and your new husband or wife; then look no further, here is a list of our favourite secret safari hideaways which will be perfect for your romantic getaway together. After the excitement of planning all the details of your big day, the next important detail to plan is what comes next... what do you want to do for your honeymoon? A honeymoon is an important holiday and one that you will remember forever. It should be a relaxing experience in a romantic and excluded setting where you and your partner can spend time together, unwinding, relaxing and being pampered.A safari honeymoon offers luxury, peace, tranquillity and the excitement and adventure of the African bush as well as delicious gourmet food and the utmost attention to detail to ensure that your dreams of the ideal break away are fulfilled. 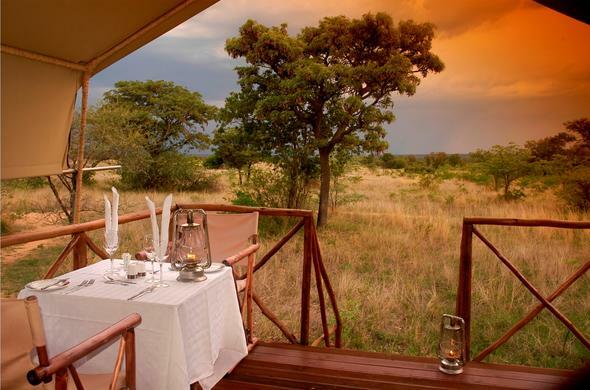 Picture yourself and your partner enjoying a dreamy gourmet meal under the African night sky, or lazing on your private deck, sipping on a glass of delicious local wine as a Kudu saunters past - if these descriptions send tingles of excitement down your spine then a honeymoon in the idyllic African bush is exactly what you need!To help you plan your romantic honeymoon we have put together a list of Limpopo's top secret safari hideaways, destinations that are easy to get to but offer the ultimate in safari luxury and romance. The ideal destination to share with someone special, Kwafubesi is located just outside BelaBela, an easy drive from Johannesburg, in the in the Mabula Game Reserve. Stay in luxury tents lit at night by hurricane lamps and the light from the moon. A rustic and romantic atmosphere, Kwafubesi is considered one of Limpopo's best kept secrets.Each private and secluded tented room is positioned on raised platforms overlooking the bush. Comfortable elegant rooms with large luxurious bathrooms equipped with stone baths and shower ensure that your stay at Kwafubesi is both comfortable and relaxing.Spend the mornings lazily reading a book or head off on an exciting early morning game drive before relaxing in the afternoon next to the sunken splash pool. Dinner is served on your private deck where you can relax and gaze into each other's eyes, reflecting on the day's activities. Cuisine in the highlight of any visit to Mhondoro Game Lodge with delicious full English breakfasts, picnic lunches, decadent afternoon teas and superb gourmet dinners served outside around the fire all combining to ensure all food lovers will be in their element. Located in the beautiful Welgevonden Game Reserve in the Limpopo Province, Mhondoro offer magnificent 5 star accommodation in a tranquil and relaxing environment. Set in a rocky outcrop just 2.5 hours from Johannesburg, Mhondoro is easily accessible and the ideal destination for a peaceful and relaxing honeymoon. Enjoy a pampering treatment at the in-house spa and wellness centre, or stretch your legs when you embark on a guided walking safari through the African bush - at Mhondoro, your every need will be seen to by friendly and attentive staff members who are on call to ensure your honeymoon is the romantic getaway of your dreams.